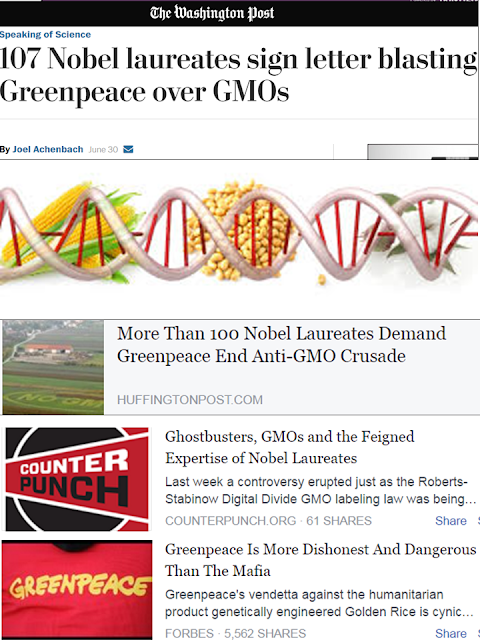 Greenpeace voodoo science was slam dunked last week by real scientists. GP do heavy political science then call it climate science, bio science. They should be ashamed of what they are doing. GP is wrong on perhaps 99% of their advocacies. Anti-coal, anti-nuke, anti-fossil fuels (yet their leaders proudly and braggingly announce that they jet set to this and that country and continent for various meetings, riding on planes that use 100% fossil fuel...), anti-GMO, anti-capitalism, etc. The 1% where they are correct is campaign against solid wastes that are thrown anywhere. 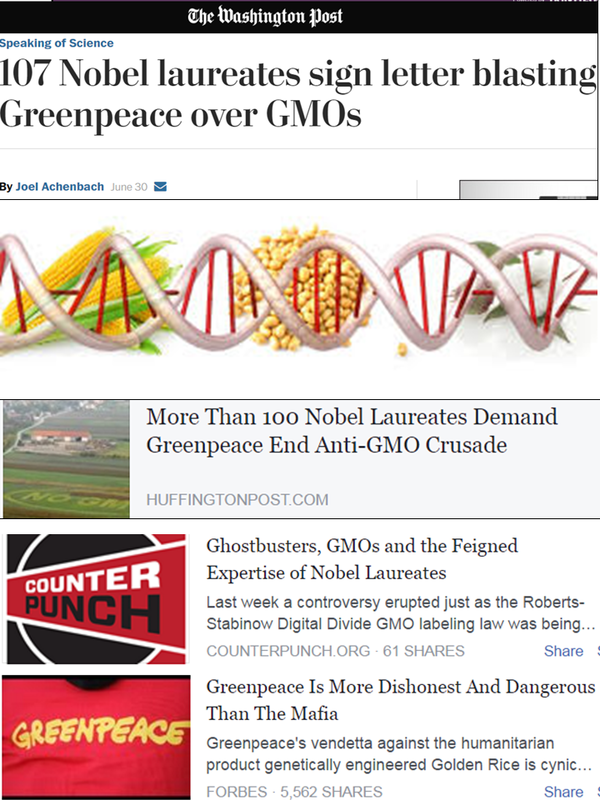 GMOs are safe. Most if not all the rice that I and millions of Filipinos have been eating since the 70s are GM rice. 4 decades or more have passed, none has become a frankenstein. And no food riots despite the population rising from around 40+ M in the 70s to 102 M now. There are some scattered studies that perhaps were not peer reviewed or published in lesser known papers saying that GMOs are dangerous and scary. The 107 scientists who speak up here are top caliber ones, Nobel laureates. Between these 100% scientists and perhaps 100% non-scientist GP militants, the former has more credibility. I think of more modernity, more prosperity, more food efficiency. The PH will soon have 200, then 300 M people and there will never be food riots. Thanks to modern science, thanks to GM science. Our farm caretaker (now 62 yo) in Pangasinan told me few years ago that when he was young, he was helping his father in rice farming and the "good" quality rice then, non-GM (no IRRI perhaps yet), could be harvested after 6 months. So after 6 months, harvest was very small -- subjected to heavy rains, typhoons, flooding, rats, birds, wild ducks, kuhol, many other pests. The key to good rice farming is to harvest the crop in a short period. The dominant varieties are still harvestable after 4 months, but there are many varieties now that are harvestable after 3 months, even 2 1/2 months. Plant quick, harvest quick, reduce exposure to various pests, and farmers' income will be higher, consumers' rice supply will be higher. Thanks to GM rice.